What are the top landmarks in Lanzarote? Explore the otherworldly terrain of this volcanic park, with rugged lava flows, resilient wildlife species and a restaurant serving meals heated by volcanic gases. Learn how to windsurf, dive among underwater volcanic rocks or simply enjoy the tropical environment of this pristine beach. Nothing says holiday like spending a lazy day at Pocillos Beach, a popular beach in Tias. Attend a sporting event in this family-friendly area. Hidden away in a nature reserve, this rugged, wild beach is an exquisite spot to unwind, enjoy the sunshine and cool off in the glittering waters. Explore the waterfront in Yaiza with a trip to Marina Rubicon. Stroll along the seaside in this relaxing area or visit its lively bars. Visit this white-sand beach for tanning, spas and windsurfing lessons in one of the most treasured attractions of the popular vacation location, Costa Teguise. Situated near the beach, this spa hotel is within 1 mile (2 km) of Jablillo Beach and Las Cucharas Beach. Costa Teguise Golf Club is 2.6 mi (4.1 km) away. Great location and a secure resort with nice cafe on complex. Clean, comfortable and great service. Restaurants booked up quickly in advance which was disappointing but the two buffet restaurants were available. Its beautiful coastline might be its best-known attribute, but Lanzarote has far more to offer than just sea and sand. A holiday on this sunny island can include everything from camel trekking to visiting scenic landmarks, such as the majestic Timanfaya National Park, known for its volcano and atmospheric caves. With its famous beaches, dynamic nightlife and tranquil mountain trails, Lanzarote is a land of contrasts. In Lanzarote, you can enjoy a subtropical climate with little rain almost all-year round. Look for hotels close to one of the island’s many black-sand beaches to take advantage of the great conditions for windsurfing. If you have plans to go hiking, you may want to consider hotels near a protected area such as Los Ajaches, a mountain range popular with walkers. Other accommodation options for an active holiday include hotels in Orzola, where the Chinijo archipelago lies just off the coast. You’ll find outdoor attractions worth adding to your itinerary all over the island. Los Hervideros is a stretch of coastline known for its distinctive volcanic rock formations. To the north, the Janubio Salt Flats offer a different kind of spectacle, with broad white fields stretching towards the horizon. In the south, meanwhile, is Charco Verde Lagoon, a peaceful place to swim, sunbathe, hike and take beautiful photos. The jewel in Lanzarote’s crown is the Timanfaya National Park, where you can ascend to the edge of Timanfaya Volcano on camelback and take a guided tour of the area. In the vicinity of the volcano you’ll find a choice of restaurants where you can watch your meat being grilled in an opening in the ground. A visit to the park also offers the opportunity to discover the works of architect César Manrique, or to visit the volcanic-rock vineyards of La Geria, located just to the south. Take a look at our hotels near Timanfaya National Park to get a sense of the selection of accommodation available. Arrecife is the island's capital. The port city is home to the Castillo of San Gabriel, which today houses Lanzarote's archaeological museum, and the Castillo of San José, now the modern art museum, MIAC San José. Other interesting buildings include the historic Church of San Ginés. As the town is reasonably compact, any one of our selection of hotels in Arrecife should put you within easy walking distance of the main attractions. Few people visit Lanzarote and don’t go to the beach. Whether you’re looking for somewhere to surf, swim or just relax, Playa Honda, Playa Grande and Playa de Papagayo are worth a visit. In the evening, you can sample the local delicacies in a beachfront restaurant or head out to one of the town’s many bars or clubs. Does Lanzarote Have Family-Friendly Hotels? Lanzarote is a very popular destination for families. 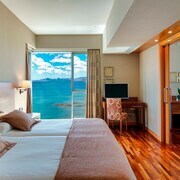 You’ll find many different types of accommodation here that cater to people travelling with children of all ages. Often, extra sleeping spaces, including cots, can be added to bedrooms for no extra charge, and many hotels also have a pool where kids can splash around during the day. 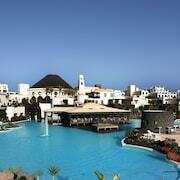 Hesperia Lanzarote in Yaiza is one good option if you’re looking for five-star family accommodation. It features rooms specially designed for kids, as well as children's furniture and toys in adult rooms if needed. Take a look at our full list of family-friendly hotels in Lanzarote to find something a bit different. Can You Pay for Hotels in Lanzarote on Credit or Debit Card? Many hotels allow you to reserve your room owith Expedia, but pay when you actually arrive or check out. 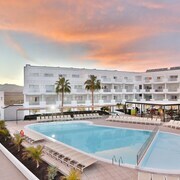 In these cases, you may want to check if the hotel accepts card; however, the vast majority of hotels in Lanzarote do. Cashpoints are also found throughout all the most popular areas, so even if there’s no card machine, paying for your hotel should be straightforward enough. Just remember that your bank may charge you for overseas transactions. The most fuss-free method of payment, of course, is to pay with your credit or debit card via Expedia at the same time as you reserve your hotel. 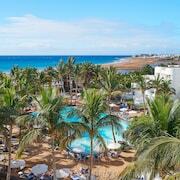 Almost all of our hotels in Lanzarote accept online card payments through Expedia. Spain’s mainland has just as many great beach destinations as its islands. Check out our hotels in Benidorm for more coastal holiday inspiration, or see if one of our hotels in Marbella suits you. Explore Lanzarote with Expedia's Travel Guides to find the best flights, cars, holiday packages and more!